The Supreme Court building in Washington. FDR’s 1937 plan to pack the U.S. Supreme Court with extra justices is being floated by at least one Democratic presidential candidate. However, Georgetown Law Professor Adam J. Levitin explains that dramatically expanding the court would benefit both parties and make the court the politically neutral branch of government it was intended to be. “Court packing” is the latest idea to have taken hold among 2020 Democratic presidential candidates, and for good reason: The U.S. Supreme Court as currently configured looms as an obstacle to any Democratic legislative agenda. Yet despite the obvious partisan appeal of adding justices to the court to shift its political balance, there’s actually a much better, nonpartisan reason for expanding the court and doing so radically. Instead of merely adding a couple of justices to create a majority of Democratic nominees, the court should be expanded substantially, such as to 33 justices, as a way of depoliticizing the court and, by extension, the nomination process. A larger court would have more frequent turnover of justices, which would reduce the stakes for any particular nomination. Justices would roll on and roll off the court with more regularity, such that a nomination would not be a defining event of a presidency or reshape the court for a generation. As a result, the precise partisan balance on the court would be of less importance. Even if two-thirds of the justices on the court were nominated by a single party, there would often be panels in which justices nominated by the other party were a majority. Likewise, forcing the court to sit in randomly assigned panels would eliminate the position of the “swing” justice to whom litigants tailor their arguments. The presence of a “swing” justice essentially reduces the Supreme Court to a court of one and dramatically raises the stakes of a nomination. It’s not a healthy thing for the judicial system for litigants to address their arguments to one man alone, be it Chief Justice Roberts now or Justice Anthony Kennedy previously. Increasing the size of the court such that it would have to adopt a panel system would eliminate the winner-take-all nature of Supreme Court nominations and eliminate the ugly spectacle of the numerous 5-4 party line decisions that make the court look like nothing more than an extension of the political parties, rather than a nonpartisan branch of government. Critically, expanding the court can be done by a simple act of Congress. No amendment to the Constitution would be required, unlike other court reform proposals, such as changing life tenure for justices, having some justices chosen by other justices, or involuntarily reconfirming justices to lower courts. An expansion of the court legislatively is on rock solid constitutional ground because the Constitution does not specify the number of justices on the Supreme Court; that decision is left to Congress. 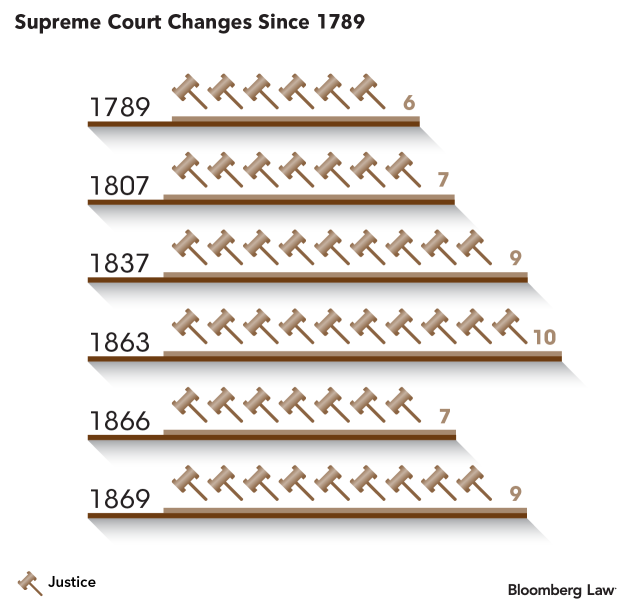 Indeed, historically the size of the court has fluctuated between six and 10 justices; there’s nothing magical about nine. There may also be reason for both parties to agree to a nonpartisan expansion of the court: it’s unclear who will control the Senate and White House after 2020. Republicans, however, are clearly scared the Democrats will pack the court if they gain power. Thus, Sen. Marco Rubio (R-Fla.) has called for a constitutional amendment to calcify the size of the court at nine justices. Rubio’s amendment has no chance of passing, but if Republicans are worried about a post-2020 partisan restructuring of the court by Democrats, they should seek to cut a deal for a nonpartisan expansion now, while they still have some leverage. And Democrats should recognize that merely expanding the court by a couple of seats only sets up a future matching move by Republicans. Partisan court-packing is a losing game given that no party will remain in power forever. Supreme Court expansion need not be a partisan issue. Indeed, the very best reason to expand the court is to ensure that the court is no longer a partisan football, but the politically neutral branch of government it was intended to be. It’s time to start talking about a nonpartisan expansion of the Supreme Court, rather than partisan court-packing. Adam J. Levitin is the Agnes N. Williams Research Professor and professor of law at Georgetown University Law Center.